Target carries vegan basics like tofu, rice, beans, frozen veggies, non-dairy milks, seasonings/spices and meat alternatives. Throwing a meal together can be a snap if you just step outside the box and look around. When buying a new vegan cookbook or looking at blogs online I am often disappointed if the recipes call for special hard to find ingredients that have me order them online or try to locate them in a specialty market that I may not have in town. So when I come across a recipe that I can make from simple to find ingredients I bookmark it and get to work on dreaming up a meal around it. The Garlic Broccoli with Coco-Peanut Sauce from Plant Based on a Budget is a meal that is easy to put together from the aisles of Target, affordable and easy to make. Bonus it is super yummy! 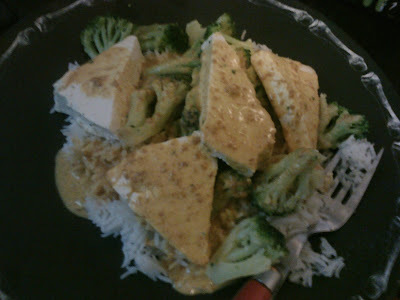 The only things I changed from the recipe was using organic maple syrup instead of brown sugar, garlic powder for garlic (no fresh garlic at Target), I added a squeeze of Sriracha and I added some extra firm tofu triangles to the mix. Bagged broccoli again came into play and I used basmati rice. This meal is something I will make again. Creamy peanuty taste with a hint of kick (I might add more Sriracha next time), afordable and a thumbs up from Matt. are those rice noodles under that peanutty tofu? Yes, yes you did say that. Yikes!and you know how I love basmati rice too. This sounds like a recipe I'd love. Broccoli, tick! Garlic, tick! Peanut sauce, tick!